Use this method if you want to sell clean Plesk instances together with a number of commercial extensions. This method does not support the in-app purchasing scenario. You need to have both Plesk and the extensions you want to resell available for purchase in your online store. When a customer places an order, you need to contact KA via the KA Partner API and request licenses for the ordered items. KA will create the requested licenses and send you a single activation code for these licenses. Note that KA has two versions of the Partner API: v1 and v3. Can request both the main Plesk key and multiple additional keys for extensions in a single call (see createKey()). Uses a single activation code for both the main Plesk license and all additional license keys. Can request only one key (either the main Plesk key or an additional key for an extension) in a single call (see Creating a License Key). Uses a single activation code for both the main Plesk license and all additional license keys (additional keys requested in separate API calls are attached to the main license. The activation code for the main Plesk license will activate all attached additional keys as well). After your store receives the activation code, you can either give the code to the customer (via the online store UI or email). Alternatively (and preferably), you can activate the licenses by running a CLI command on the Plesk instance you have created for the customer. You can activate licenses via CLI using the “license” utility (Plesk for Linux, Plesk for Windows). Use this method if you want to upsell extensions in your online store for already provisioned Plesk instances. When one of your customers clicks the “Buy Now” button in the extension catalog in Plesk, they are taken to your online store where they can complete their order. When a customer places an order, you need to contact KA via the KA Partner API and request a license for the purchased extension. Pass the main Plesk key number as an argument in the API call. KA will create the requested extension license and attach it to the main Plesk license. Click Tools & Settings in the left navigation pane. 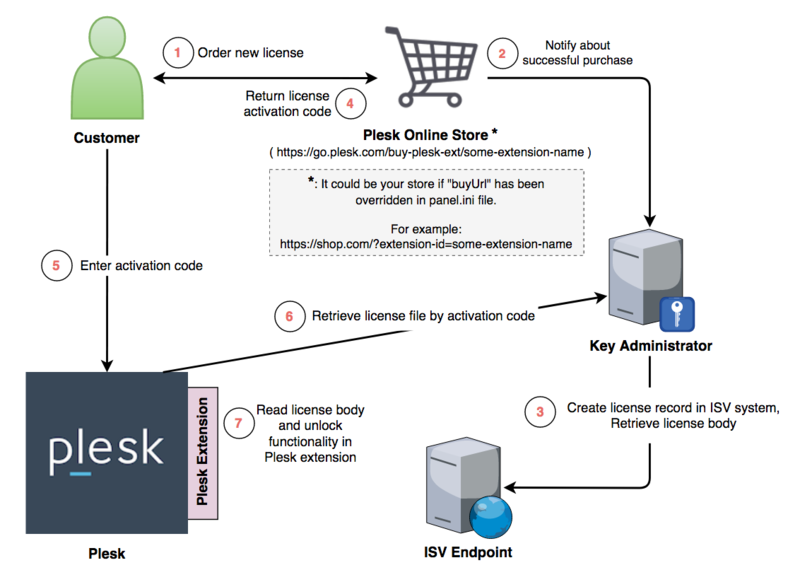 Click License Management (under Plesk). Click Retrieve Keys to install the new license key in Plesk. By default, when a customer clicks the “Buy Now” button in the extension catalog in Plesk, they are taken to Plesk store, not your store. You can change this behavior by specifying your own store hostname in the panel.ini file. Once the store hostname has been customized, all “Buy Now” links and other possible upsell links displayed inside the extensions will lead to your online store. where "shop.com" is the domain name of your online store. The ID of the extension. Find the list of extensions and their IDs (“codes”) here. Please note that “Extension ID” corresponds to extension-id in Excel files, and “extensionId” corresponds to extension-id in JSON files. The main Plesk key number. Pass this key number as the parent key number in the Partner API call. Optional parameters. Required only for the “Individual Offers” licensing model. With this licensing model, website owners can purchase products and services by themselves as needed. This is done by adding a link in the Plesk UI that allows end users to place orders. First, the end user selects the desired website, then selects the desired product among the products offered by the extension, and then proceeds to the online store to complete their order. Note that “Extension ID” and “Extension Product ID” corresponds to extension-id and product-id respectively in Excel files, and “extensionId” and “extensionProductId” corresponds to extension-id and product-id respectively in JSON files. First, it must be decoded according to the URL-encoding mechanism. Then it must be decoded according to the BASE64 encoding. Partner API v1: Use the “guid” parameter in a createKey() call. Partner API v3: Use the “activationInfo” parameter in the License Key Structure (Full). Note: This feature will only affect extensions sold by Plesk that use “go.plesk.com” as the destination hostname. If an extension is sold directly by an ISV, its “Buy Now” links and other possible upsell links will not be affected. Once you have changed the URL for the “Buy Now” links as described above, all commercial extensions, including those that will be added to the Extension Catalog in the future, will lead to your store, even if you have not set them up yet. You can make sure that your customers will only see the commercial extensions that you are ready to sell by configuring a smart proxy server for the Plesk Extension Catalog. This proxy server will take the Extension Catalog feed, filter out the extensions that you are not ready to sell, and provide the modified feed to your Plesk instances. Set up a server (physical or virtual) where the proxy script will be running. Download the proxy script to the server. This link contains the instructions explaining how to deploy and operate the script. Configure the proxy to pass through only those commercial extensions that should be visible on your Plesk servers. The proxy works as a whitelist – you need to specify the IDs for the commercial extensions that should be displayed in Plesk; nothing else will be visible. Important: The proxy only affects the extensions whose “Buy Now” links point to https://go.plesk.com. Free extensions and extensions whose “Buy Now” buttons point elsewhere are not filtered by the proxy. They will be visible in the Extension Catalog on your Plesk servers regardless of the proxy settings. When a new commercial extension becomes available in the Extension Catalog and you have set up your store to sell it, modify the proxy by adding the corresponding extension ID so that this extension is passed through and is available to your customers. Note that the catalog feed is cached on Plesk servers. New extensions will not appear immediately.